This dive watch is water resistant to 200 meters (660 feet). The band is made of black rubber. The dial is black. The stainless steel bezel is black with gray numbers on it. 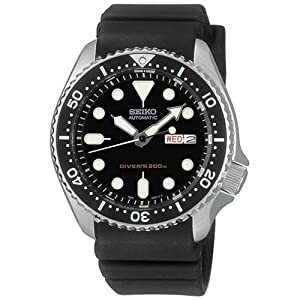 Yes, this watch is perfect for divers, ninjas, and any man who loves black. It has the standard luminous hands and markers for telling time in low light. And the unidirectional rotating bezel is standard for any self-respecting diving watch. The calendar shows the day and the date at the 3pm position. It uses an automatic movement and comes with an attractive gift box, which makes it easier to give it as a present to someone.